When you think of premium grade timepieces, brands like Rolex, Patek Philippe, and TAG Heuer are probably the names that pop up in your head. While it’s true that these legendary Swiss brands have some of the finest collections of watches, it doesn’t necessarily mean that the new and upcoming brands should be completely overlooked! Being a watchmaker for years, I have a lot of sympathy towards some of the new brands that create some fantastic quality timepieces but don’t really get the appreciation they deserve. The centuries-old legacy of the Swiss makers always seems to overshadow them. Jack Mason is a brand that I feel is one of the most underrated in the industry. They make watches that are on par in terms of quality with the Swiss makers and also sell at a price significantly lower than their Swiss counterparts. It’s high time you look beyond the Swiss makers and give this brand a shot; I promise it will be worth it! 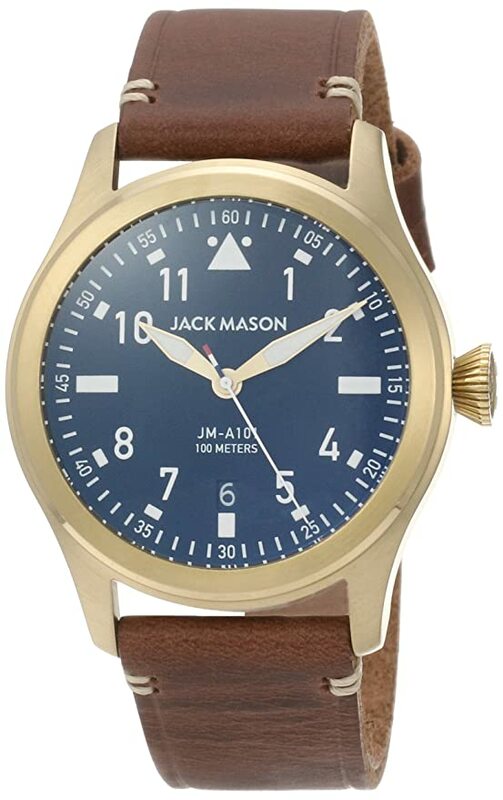 Jack Mason is an all-American brand that is relatively new to the watchmaking industry. It was launched around five years back with a unique vision of merging classic American influences with modern designs to create a brand of watches with an international appeal. In my opinion, their watches indeed do a pretty fantastic job at combining American themes with the sleek contemporary designs. Although their college-themed watches receive very little recognition, their line of products, particularly the more premium ones, are extremely well built and have the kind of attention to detail that you’d expect in more expensive watches. 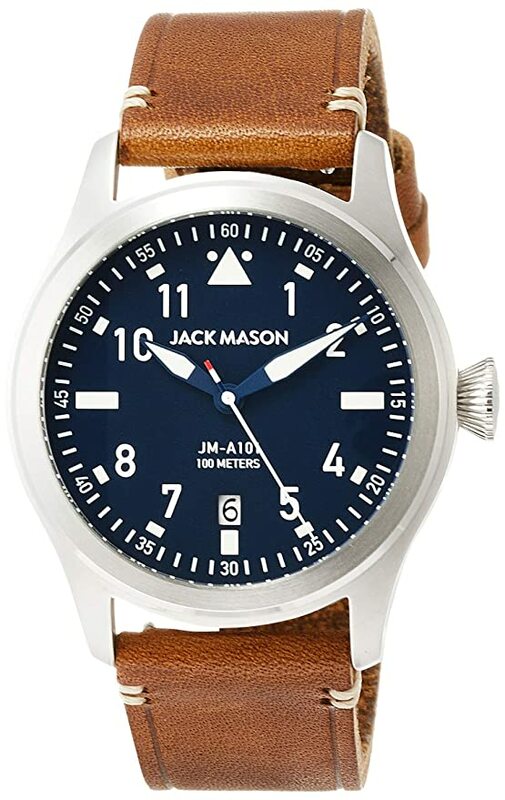 I discovered Jack Mason a little over a year back while looking for a watch to gift for my son’s birthday. As I browsed through their catalog, I was amazed to see a vast range of classy chronographs with some of the most refined looking designs that you could possibly find at this price range. Being the watch addict I am, I couldn’t help but get myself a pair of chronographs – one from their Aviator series and the other from their Nautical series. I will discuss in detail about both of them later in the article, but first, let’s take a brief look at the company’s history! Jack Mason’s story began in Dallas, Texas when a pair of friends with similar passions for crafting best-in-class products entered the retail industry! The brand itself was established only five years back when the duo decided to take the leap and establish their own brand. Armed with deep insights into the world of retail and marketing with over 25 years of experience in the field, the duo finally created Jack Mason. The brand’s vision was to establish an all-American watchmaking company that blended classic American themes with the modern sleekness of contemporary styles and provide quality timepieces at affordable rates. An interesting fact about the brand is that the duo founded the company inside a vintage Airstream. In fact, when they rolled out their first collection of Jack Mason watches, they went out on a month-long tour across the country to showcase products aboard their Airstream. Since then, their watches have done pretty well in the market with their brand growing at a steady pace every year. They have also successfully managed to bring premium quality watches closer to the reach of ordinary folk with modest price tags on their products. For a brand that has only been out there for a few years, Jack Mason has a surprisingly large collection of premium grade watches. Ranging from elegant looking analogs to sophisticated chronographs, the choices are plenty. As I have said plenty of times before, I am a sucker for chronographs. 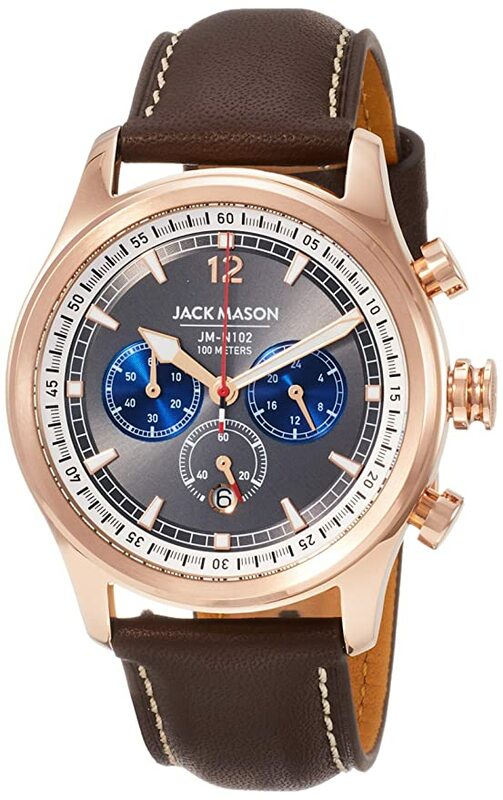 And if you are looking for a sleek-looking, well-built chronograph that doesn’t cost you an arm and a leg, Jack Mason is just perfect! Their Aviator and Nautical series of watches have the best collection of classy timepieces that could go along with pretty much any kind of look that you’d like to rock! 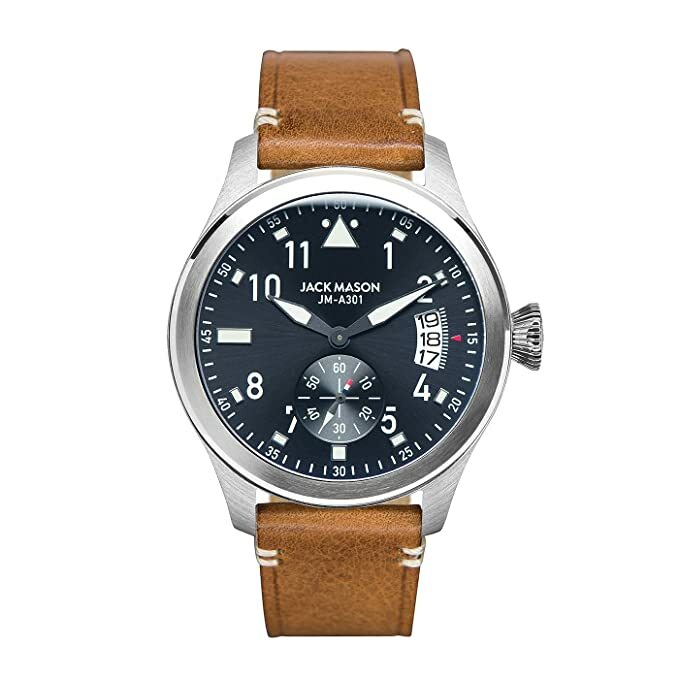 Browsing through their Aviator collection, the watch that impressed me the most was the Jack Mason Aviator Chronograph. It was an instant buy, and it is also probably my most worn watch throughout the past year. It features a prominent 42mm case with a nice compactness to it that keeps it from looking too hefty. So even if you have a small wrist, you could totally rock this on your wrist! It also comes with a nicely polished case alongside a charming navy dial that has a strong classic-yet-contemporary vibe to it. The Italian leather straps are very well executed, featuring a distressed and dark finish to it. Overall, a well-balanced and value for money timepiece! I decided to get myself the Nautical Chronograph after spending nearly two hours of browsing through their Nautical collection. I was much more impressed with their Nautical range of watches than their Aviator collection. 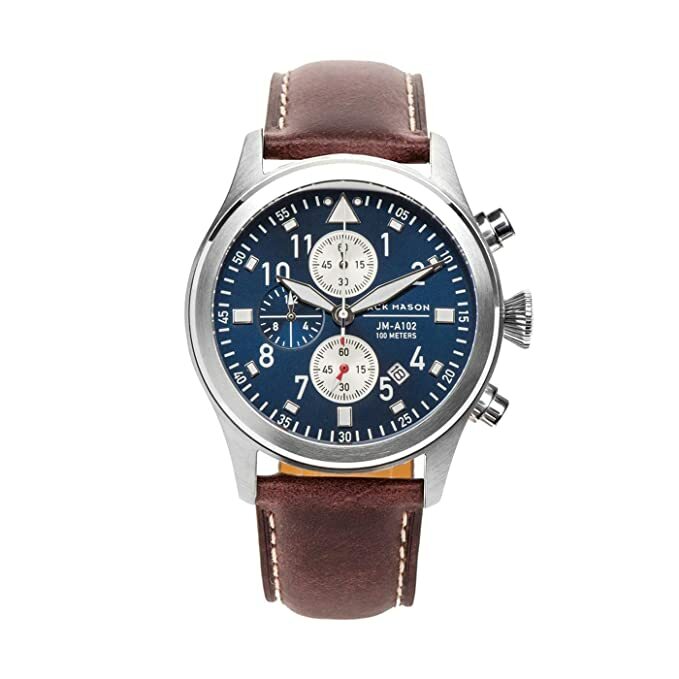 In contrast to the other one I bought, the design of the Nautical Chronograph was more eye-catchy and much more likely to stand out in a party. It features a classy white dial enclosed in a well-built 42mm case. The best part about this chronograph is undoubtedly the outstanding quality of the Italian-leather strap that has a beautifully finished tan which does a tremendous job at complementing the elegant white dial of the watch. Both the Nautical and Aviator watches feature the extremely accurate Japanese Quartz movement and have decent battery life. I highly recommend giving the Nautical Chronographs a try if you are looking for an affordable semi-formal chronograph watch! Although a new player in a market full of legendary brands, Jack Mason does an outstanding job at proving a huge collection of watches whose charm and sophistication can match up to the standards set by the historic brands. If you’re looking for a pocket-friendly alternative to the Swiss watchmakers, I highly suggest giving Jack Mason’s range of premium watches a try!